An easy way to 'steep' tea is in the refrigerator, or even on the counter. This requires no boiling or pouring of hot water. 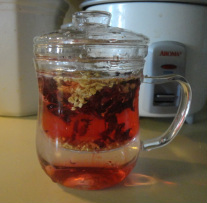 Shown here is loose Hibiscus-Ginger Tea in a Glass Infuser. It steeps in just a few minutes at room temperature.